My family has requested perogies for dinner tonight and as much as I’d like to try to make them homemade, that just isn’t going to happen. So I figured if our main dish at dinner is from a frozen blue box, then our side dishes should be fresh and flavorful. Perogies are an amazing Polish entree that can have a variety of fillings inside. I remember a booth at the West Side Market in Cleveland, Ohio, that offered dozens of options– meat-filled, cheese, fruit, dessert, the list just kept on going. I’m making a sauteed cabbage and onion recipe in the crock pot today and the taste will really go nicely with my smooth, simple potato and noodle pockets. But someday, I’d love to go back to that booth in Cleveland and stock up on some crazy combinations instead. This side dish would go great with almost any meat. The salt helps the cabbage break down and the wine and sugar really add to the natural sweetness of the onion. If you’d like a different color for presentation, try swapping julienned carrots for the red cabbage instead. 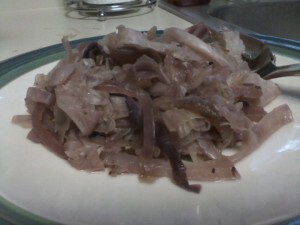 I like the red cabbage because it gives the onions a really nice translucent purple color. Enjoy! Put everything in the crock pot and stir together. Cook on low for 4 hours.